Below you’ll find a set of infographics which will help you in identifying yourself at the “UX skills ladder”. Take a look at these 10 short keywords which should sound familiar to every UX Designer – beginner. If after reading this you discover that you’ve never heard about something described here it means that you should definitely get to know more in this area to be a better UX Designer. If some area is known to you but you feel that you don’t have enough knowledge in it – read, explore, learn and observe others. 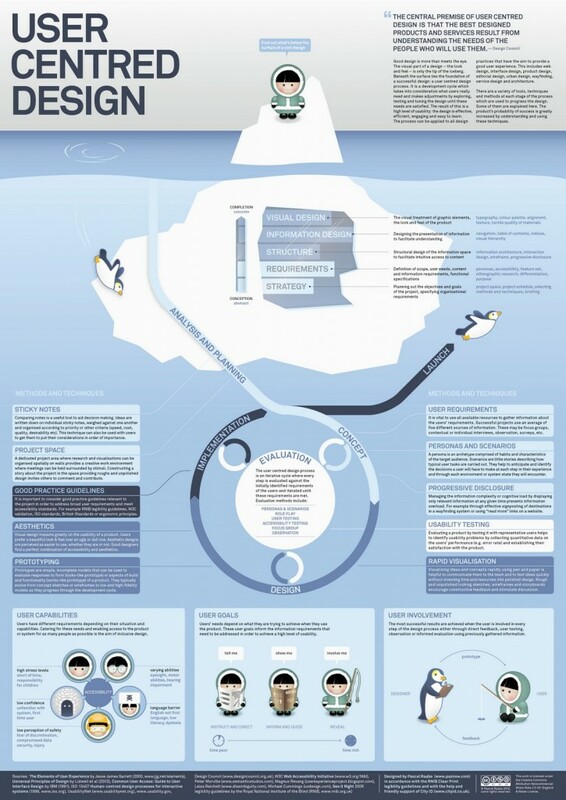 A very common symbolics of the iceberg can be also applied to UX because it’s the most accurate. 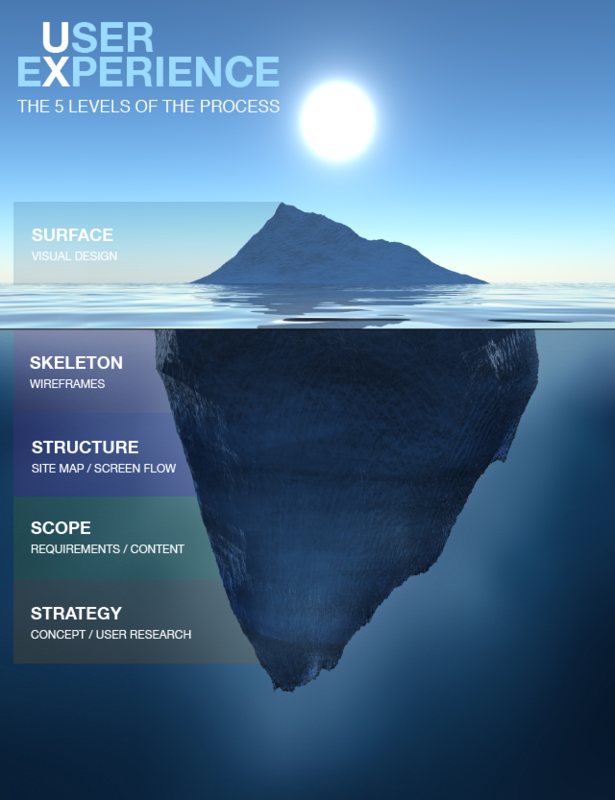 What you can see, the visual element to the work of a Designer, is just a tip of the iceberg. The rest of the processes (which are the main part) are hidden underneath. You need to be aware of them and pay great attention to them because they have the final word on the success of the whole project. 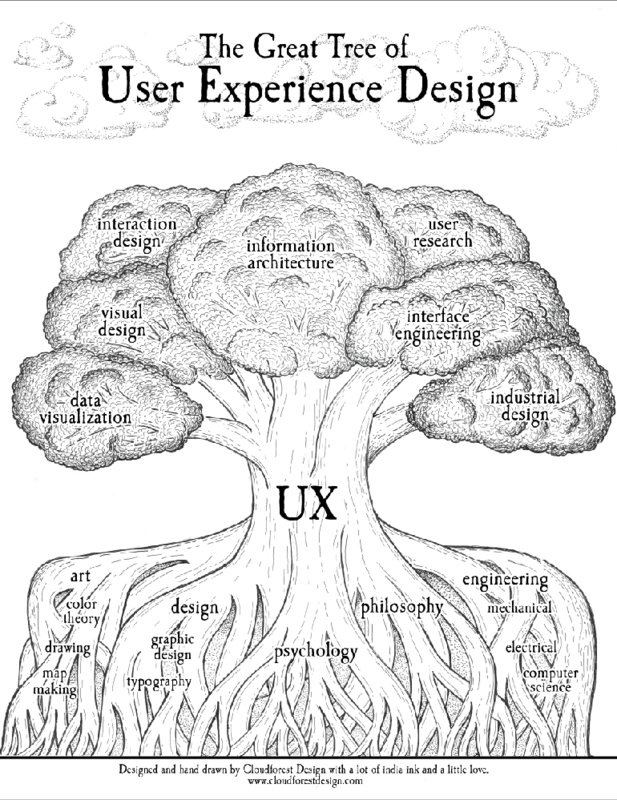 What User Experience Design really stands for? As you can see below UX comes from several seemingly different and separate fields like: psychology, philosophy, design and engineering. This is the uniqueness of UX – it connects the areas which have previously just “touched”. Currently we can observe new branches emerging in the field like information architecture, visual design, interaction design and others. This infographic presents a digest of knowledge on user interaction both if it comes to interacting with websites and apps in the area of design and functionality. It presents facts and data on user behaviour, describes and briefly explains the UX Design path. It also highlights the benefits of good UX from the perspective of a user. I think that every UX Designer would agree. Again a well-known symbolics of the iceberg will be used, now more developed with the division into tools, methods and good practices which are worth using at certain levels of the design process. Take a look at the “lifecycle of the project”. Very detailed infographic presenting the process of creating a persona. 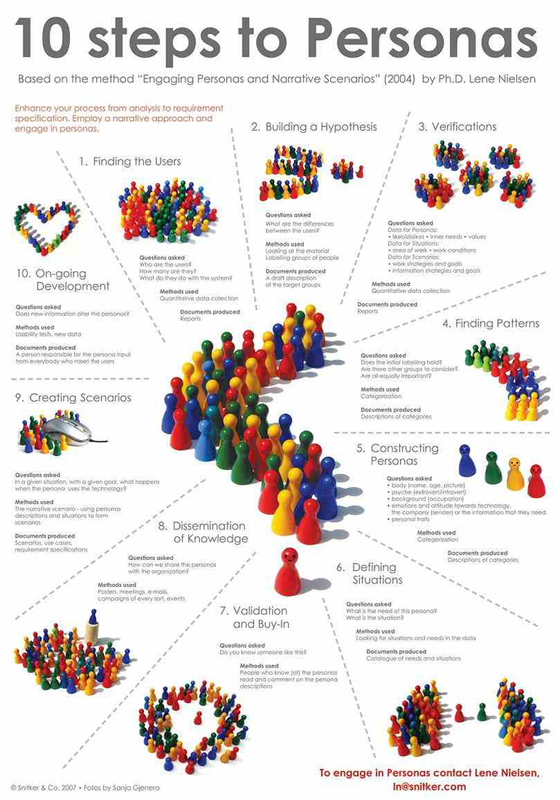 These are the 10 steps that will help you or will consolidate what you already know on how to find the right users, build the right hypotheses and verify them, properly construct personas and scenarios of use. No proper project can be created without these elements in mind! Understanding is the key to success of the website and going further we can say that it’s a key which opens the door to user satisfaction. When you want to learn more about your website/app or users’ behaviours you have one simple technique at your disposal – testing. User testing, website testing, data analysis. Try testing to identify and understand the strengths and vulnerabilities of a design. What can help you is i.e. the knowledge of what is happening at your website. Analyse your hypotheses and assumptions on what you’d like the users to do at your website. What do you care about? Low conversion at the website? High rate of cart abandonment? The data you gathered will help you i.e Google Analytics, scenario testing, A/B testing, studies using recordings of behaviours and emotions of respondents. Test, test, test and test once more! Everything and everyone. To ensure that your site / app lives up to expectations and users achieve their goals through it you need to conduct appropriate testing. It would be best to test every once in a while, not only when a problem occurs. This infographic presents what to test, which testing group to choose, when to test, with what tools and how often. But remember – every project requires individual approach. This refers to a guide to design a website in simplified form. The whole process boils down to efficient planning, design and strategic implementation. 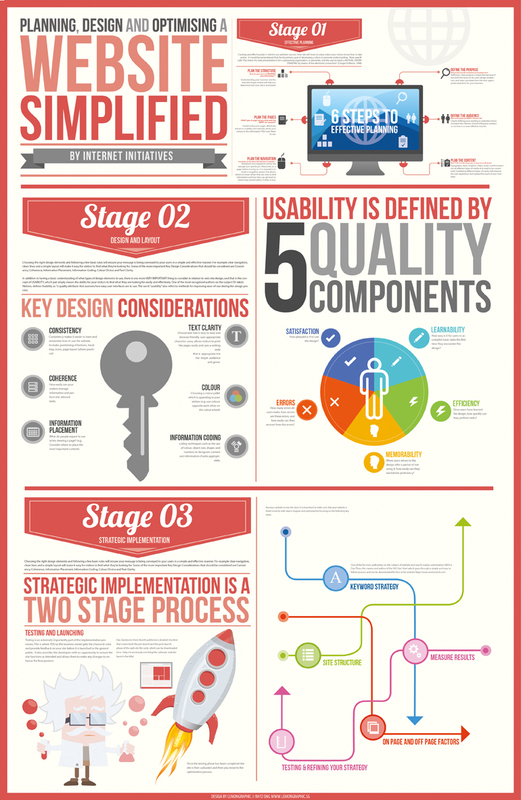 This infographic aims at changing your way of perceiving website design. This should be a straightforward and simple process focusing on i.e. five basic assumptions based on: satisfaction, efficiency, learnability, errors and memorability. Very helpful guide on UX job market and its demands. What positions emerge and where, what qualifications you need, which tools you should be familiar with, what are the most popular companies at the market. Below you’ll find all the skills required to be a good UX Designer. Check which ones you’ve already mastered and which ones you need to improve or give an additional polish. Remember practice makes perfect! creative thinking – what effectively makes a person a designer. It is the way of looking at problems or situations from a fresh perspective, suggesting new solutions. team work – the ability to work effectively in a group. 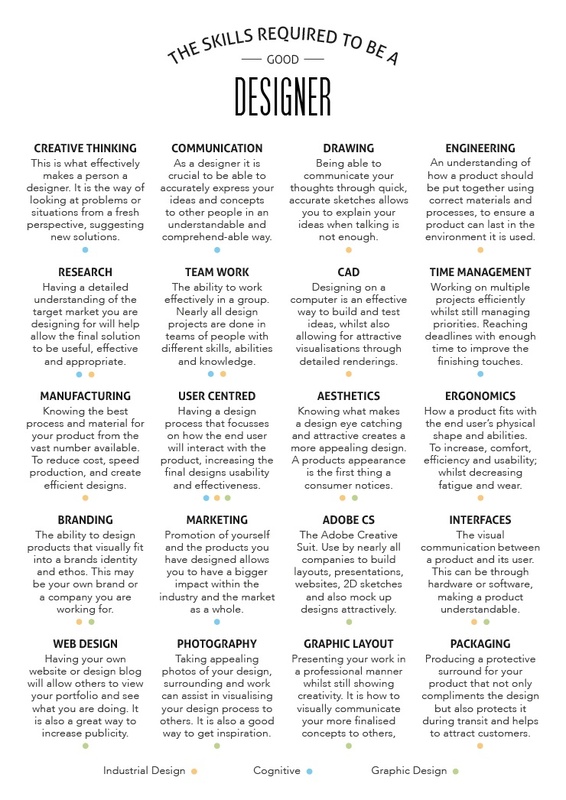 Nearly all design projects are done in teams of people with different skills, abilities and knowledge.